Synopsis: Now in his fourth year at Hogwarts, the school is playing host to the Tri-Wizard Tournament, and Harry is somewhat unexpectedly selected to take part in this deadly contest. Review: By the time a franchise reaches its fourth instalment, there is a risk that things could start to get a bit formulaic and a bit repetitive, and viewers may soon start to lose interest. 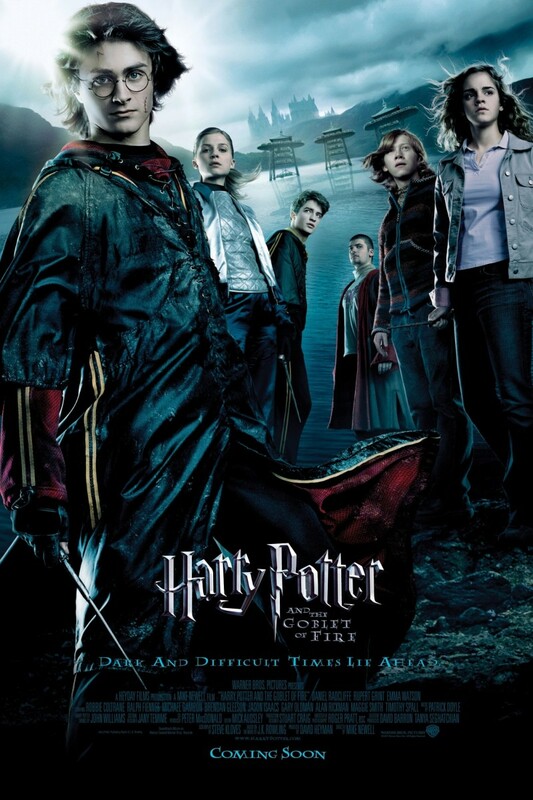 Yet in the case of Harry Potter, after coming on the back of the quite brilliant Prisoner of Azkaban, the interest remained sky high, and to counter the argument that things may start becoming repetitive, this franchise has an answer to that: The Goblet of Fire. After the dramatic end to the last instalment which went all sci-fi on the audience with the time turner adventure, the excitement picks up almost immediately with our key trio of Harry, Ron and Hermione along with members of the Weasley clan off to the Quidditch World Cup. Visually brilliant, it’s all smiles and joyful with everyone having a good time, until it all goes a bit dark and violent as hints of Voldemort are getting louder and louder. This sets everyone off in quite a melancholic mood as they board their train to start their fourth year at Hogwarts, all the while with Harry having some very dark and sinister nightmares. With this new year, Hogwarts is the stage for something special, the aforementioned Tri Wizard Tournament in which three champions compete in deadly magical tasks, with one champion from the schools of Hogwarts, with the ladies of the Beauxbatons Academy and the fellas of the Durmstrang Institute, all chosen by the mysterious Goblet of Fire. However, this one champion per school situation is made a bit complicated when Harry is also chosen alongside the other champions. Faced with no other choice, Harry must compete in this competition. After Alfonso Cuaron brought tremendous visuals to the preceding chapter, new director Mike Newell continues this trend, and also bringing perhaps some of the most gripping sequences of the franchise to date. The Tri-Wizard tasks are very well put together and edited supremely well, with excellent CGI to boot. Despite all the magic and danger involved in this chapter, Newell manages to bring something everyone has experienced at some points in their lives, growing up and falling in love. The hormones are raging throughout the story, as our lead characters in particular are having a tricky time displaying their feelings for one another. The film’s screenplay is far from perfect, but Kloves does his best to squeeze the key elements from Rowling’s novel in just over 2 and a half hours. As the actors age, their performances improve quite significantly, particularly the core trio of Harry, Ron and Hermione. The bickering between Ron and Hermione is at times funny but also at times sad, because you want them to get together, but with all those teenage angsty feelings they have going on it does make things difficult. The cast for all the movies to this point was perfect, and it remained so with the addition of some colourful new characters to the mix. The best of the bunch being Brendan Gleeson’s Mad Eye Moody. With him, the clue is in the name, he’s a colourful character, but also just a bit mental. Robert Pattinson also does a sterling job as the Hogwarts champion Cedric Diggory. Yet the most important new piece in this puzzle was Lord Voldemort, who finally makes a full appearance and is played fantastically by Ralph Fiennes. Much like the core trio of Harry, Ron and Hermione, the casting of the Dark Lord had to be just right, and in Fiennes, they had just the actor to bring this fearsome dark wizard to the big screen. With a brilliant closing battle to close this chapter of the Potter saga, it sends a chilling reminder to its audience, the dark times are returning and no wizard that dwells in the world of magic is safe. Blending the perils of growing up with great humour and adding in really dark terrifying stuff tremendously well, The Goblet of Fire demonstrated that this franchise may have started off as child’s play, but not any more.